Conclave of Wind is a multi-platform fight which requires three elementals, who do not share a health pool, to be killed within 60 seconds of one another. Players must conform to an overall strategy for killing the bosses within a set-time frame and moving between platforms at the appropriate time. Raid setups might differ slightly depending on your raid team; however, you must have tanks and healers on the platforms indicated. Everyone (including the boss) must stay out of the green goo. Everyone jumps to Nezir (center) platform at 80 energy. Stay out of the ice. Keep boss faced away from your healer. Everyone jumps to Anshal (left) platform at 80 energy. Don’t get blown off the platform. Designated player must stay on the platform throughout the entire encounter. At 80 energy, all players but the designated one will jump to Nezir (center) platform. 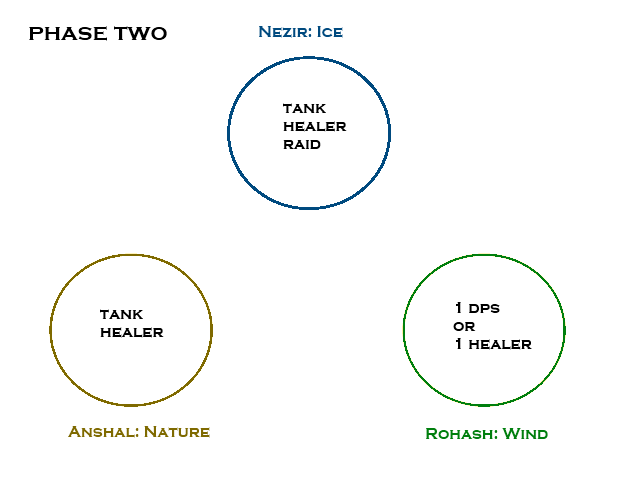 All but three players should be on the Nezir platform during phase two: a tank and healer on the Anshal platform, and a single player on the Rohash platform. 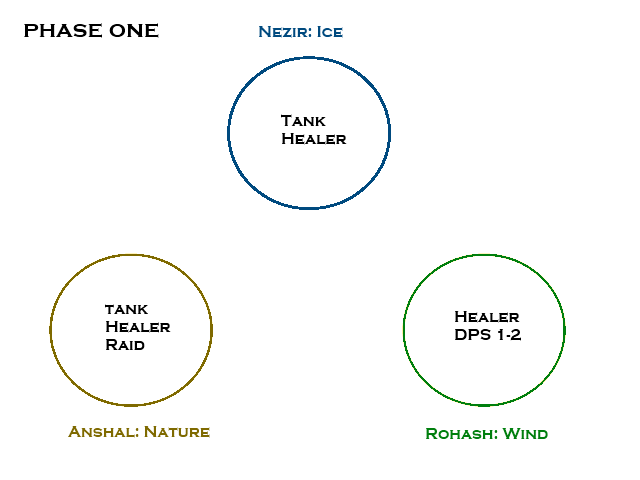 Healer and tank will remain on this platform until the end of the next Phase 1. Tank will take increased damage for 15 seconds after the Ultimate is concluded. Nezir will cast a Blizzard the splits damage among raid members. All other members will return to their previous platform when the air-bridges reactivate. Player will be sucked into a vortex and take periodic damage. At the end of the phase, the player will be dropped to the platform taking serious damage. When any of the three djinns reach 1%, a 60 second window to complete the encounter begins. If the two other bosses are not killed within this time frame, the damaged boss will heal to full. Ultimate (i.e. Phase 2 abilities) are bolded. Soothing Breeze: Green circle that heals the boss/adds and silences/pacifies players. Zephyr: Buffs the boss/adds with healing and damage. Wind Chill: Debuff that does minimal damage and increases Frost damage by 10%. Stacks. Permafrost: Moderate damage frontal cone attack. Lasts 3 seconds. Ice Patch: Does moderate damage and slows movement speed by 10%. Sleet Storm: Moderate to severe AoE damage split among all players on the platform. Slicing Gale: Debuff that does minimal damage and increases Nature damage by 5%. Stacks. Wind Blast: Knocks a player off the platform and does minimal damage. Tornado: Does moderate damage and knocks the player off the platform (generally). Hurricane: Minimal damage throughout. Fall damage is moderate to severe. Be careful of green goo. It looks just like the restoration Druid’s AoE healing spell Effloresence. Adds should be picked up by the tank and killed ASAP. Make sure that you can clearly see the energy of the boss — when it reaches 80, you should be ready to take the bridge to the central platform. When using the platform, be sure to be centered. “Side jumps” can cause you to go flying off into the ether. Be VERY careful about damage done. Anshal and Rohash need to go down to 1% in close proximity. Players on this platform are taking a stacking debuff throughout the fight, which is why you have the tank/healer swap. Frontal cone attack should only be hitting the tank and does moderate damage. Stay out of ice patches as they slow movement speed and do some damage. Make sure that you can clearly see the energy of the boss — when it reaches 80, you should be ready to take the bridge to the left platform. Damage on this platform is minimal and a self-healing DPS is perfectly capable of being left solo if required. Having a second DPS can help keep the damage even between Rohash and Anshal, but it does depend on your raid composition. (We usually start with two DPS and move one during the course of the fight). From a purely lazy perspective, ranged players are preferred as they don’t have to dodge Tornado AND Wind Blast. Wind Blast covers a 90° area. Be aware of initial facing position when the ability starts to prevent being blown off the platform. Boss’ ultimate provides healing and a damage buff to friendlies on the platform (but adds should be dead). For 15 seconds after ultimate, Anshal will have increased damage buff and tank will require extra healing. Do not remain directly in front of the air platform. You’ll just cause an ice slick to be formed there. Turn the boss away from the raid ASAP. Damage is constant but not serious throughout the Ultimate. Players should be prepared to return to their platforms immediately following the ultimate. (15 seconds). It is not uncommon for Rohash to be casting Wind Blast at the end of Phase 2. Players returning to this platform should look before they leap! Instant cast spells can be cast. Players with fall-reduction abilities/items can prevent the painful fall damage at the end of the ultimate. If your DPS does not have fall reduction/self-healing capability, consider leaving a healer. Once Anshal/Rohash are down to 1%, focus all DPS efforts on Nezir on the central platform. Thanks to Nykitaa for the video!